Bananas are one of the most popular fruits. Worldwide, about 15 million tons of bananas are exported every year. Bananas grow in masses on shrubby plants. The banana-growing industry provides a livelihood for many people living in warm climates. Bananas are related to ginger. More than 1,000 varieties of bananas grow in 150 countries. They have exotic names, such as Blue Java, which has blue skin; the Macabu, a black banana; and the lemon-flavored Burro banana. Health experts disagree on bananas’ nutrition benefits. While they’re low in calories and fat and they’re a good source of potassium, they’re also high in sugars and carbohydrates. Best bet: eat them as part of a varied diet. Bananas are healthy and delicious, but their skins are pretty awesome too. Rub a banana skin on an insect bite to sooth it. Rub it over a DVD or cd to fill scratches. Use it to remove stains from clothing, polish shoes, and even whiten teeth. One study found that eating green bananas can help control diarrhea and lower blood pressure. Another study found that a banana’s nutrition content rises as it ripens. Question: Are banana peels poisonous? Answer: This is a common belief that is unfounded. In many parts of the world, people eat banana peels boiled, fried, or baked. Banana peels are very nutritious. Banana peels should be carefully washed to remove any dirt or pesticides. Find out how bananas are grown, harvested, and shipped. Declan, Tobin. " Fun Banana Facts for Kids ." Easy Science for Kids, Apr 2019. Web. 23 Apr 2019. 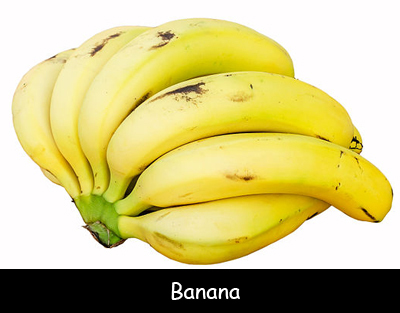 < https://easyscienceforkids.com/banana/ >.